There is a new type of induction becoming available. Up until last year you placed a pot on a burner, and that was how you cooked. Thermador changed that notion. With the Thermador Freedom, you place a pot anywhere, because the cooktop was one large burner. Now Viking has a new induction cooktop with similar technology, due out in May/June. So we compared the specifications of both as well as the companies. These two cooktops are best in class. Viking is an American manufacturer based in Greenwood, Mississippi. They are best known for their cooking products. They were the first to introduce commercial–type appliances into the home. Their products make a statement and have a distinct professional appearance. Viking was recently acquired by Middleby of Ohio, a commercial cooking supplier. Viking has experienced some difficulty and consumers found an overabundance of minor service issues, especially with their customizable yet inexpensive D3 line. Their new owner has a commercial background and understands how to build products. I am optimistic of Viking's future. However, a brands future at Yale is tied to its reliability. With 20 service technicians on the road, we will know quickly. I love the look of their new products, especially their induction. Viking has a fairly long history with induction cooking. MagneQuick(TM) Induction Elements Cook quickly and efficiently with induction heat generated by the exceptionally responsive MagneQuick(TM) power generators. MagneQuick(TM) induction elements utilize magnetic energy for superior power, responsiveness and efficiency. Thermador is a luxury brand manufactured by the BSH Corporation. Thermador produces some of the best cooking products in the industry and their integrated refrigeration is very attractive. Thermador is one of the most reliable appliance brands, and is the only mass premium brand to be in the top 6. The Freedom has been available for about a year and works well. They are continuing their One-Two-Free promotion next year with free dishwasher and hood so you can still purchase a great appliance package for your springtime project or renovation. 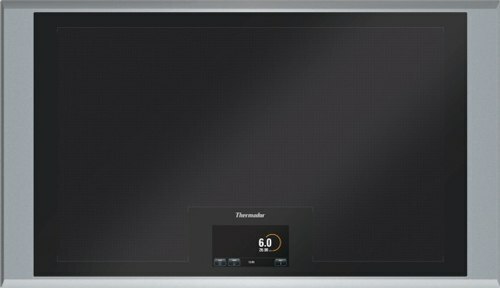 Although Thermador makes other induction cooktops at a lower price point I decided to list the Thermador Freedom cooktop, the most innovative induction product out there. The whole cooktop is essentially a large burner so you can place your pans anywhere on the cooktop surface. You no longer need to worry if your pans will fit the burners. 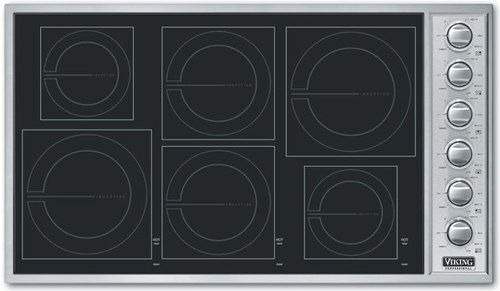 48 induction elements deliver more than 63% usable cooking surface than the competition. Place up to 4 pots or pans anywhere on the cooktop surface in any configuration. Featuring the first full color touch screen induction user interface on the market. This intuitive interface offers better control and faster access to cooking settings. Freedom to move. If you need to move your pot to another location, the cooktop will transfer all of your programmed settings to the new position of the pan. Thermador is available while Viking is not, so Thermador has an immediate advantage. Viking has a really cool look and has the ability to cook 6 pans. Viking also has a longer warranty of 3 years. Download the Yale Induction Cooking Buyers Guide with features, specs and inside buying tips to every brand. Over 55,000 people have read a Yale Guide.